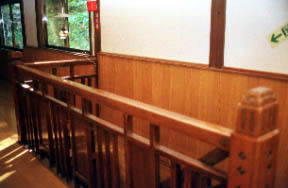 Building the second floor (the third floor of the part) of wooden [ of the initial building of Showa ], foundation is the Edo last stage.Composure and "good work" of a guest room which are nostalgic to a latticed window, a railing, and a stairs handrail are felt, and it is imagined whether this is a spa resort building of those days.The posture which those with size and one person also say as an important visitor according to the number hears about a guest room which became intricate.And the Lord is living here, without changing the inherited life, and lamps are necessaries.It generated electricity only in order to use a washing machine, and it was said that only an electric refrigerator wanted.A meal has volume and the meal of the inn of a mountain is like [ which cannot be considered ].Please ask, when a day sets in the inn of an enough lamp life at an accessible place.In a guest room, a lamp is lighted and it is the beginning of a lamp life. 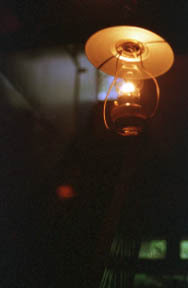 There is no putting out lights which has burned the lamp all night long. The stairs handrail of a zelkova with a beautiful railing. ■ Suffer a great deal of damage in Iwate and the Miyagi inland earthquake in 2008, and it is discontinuance of business. 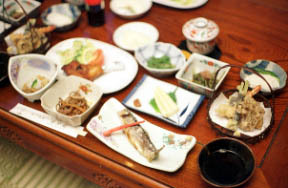 Wild grass and fresh water fish cuisine. If fate avoids the bud, the Aiko, Shidoke, Urui, etc. of a codfish in a Ms. Ms. wen, and autumn, they will be natural maitake mushrooms (usually local cultivation thing) in spring. Meal place: Every morning and evening hall. 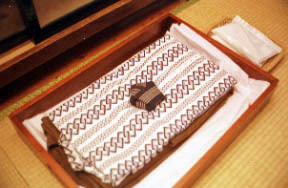 Child: The same dish as 8800 yen and an adult, with a yukata. Infant (up to 4 years old): It is no charge when you have bedclothes nothing and no dish. It is free-flowing hot-spring water about the same fountainhead as man-and-woman one open-air bath each. 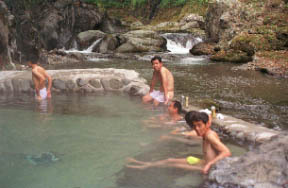 The Large open-air bath of mixed bathing is one. They are those of a Separated by gender with a spare clothing hut, and swimsuit prohibition to the neighborhood. A calm large open-air bath. 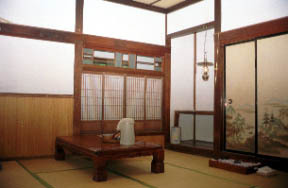 Ten rooms, 20 persons accommodation. They are about ten sets to the around bridge of a yunokura entrance.